Use this GoDaddy Coupon to get 12 months of GoDaddy web hosting for just $12. Also get a free domain name for a year. Copy this GoDaddy Promo Code and paste at the time of checkout on the payments page. Get Godaddy Economy Hosting at just $1/month. It comes with a free domain name and choice of cPanel or Plesk control panel. Get Godaddy Wordpress Hosting at very low introductory prices. Get GoDaddy Deluxe and Ultimate hosting plans for 50% off the regular price with this discount code. Also get a Free domain name with your purchase. Now Indian customers can get GoDaddy Economy Hosting at just Rupees 99 per month along with a Free Domain Name. Save a total of 35% on your order of new products. No Minimum. Enter code at checkout. 34% OFF on new products. No Minimum. Save 34% on your order of new products with this exclusive coupon. Enter code at checkout. Save 30% on your entire order of new products. Includes discount on shopping carts, email, SSL certificates etc. Take 30% OFF your shopping cart at GoDaddy with this Coupon Code. Valid for new buy, renewal and upgrade. New Domains now available from GoDaddy at 30% discount. Get your .SHOP, .ONLINE , .SITE, .TECH, .NEWS, .GURU, .UNO, .LUXURY, .CLUB and more! When you are buying domain names in bulk, you can use this Godaddy promo code to buy unlimited .COM domain names at only $9.99 each. Register a .COM domain with GoDaddy at a price of $0.81 per year. ICANN fee is extra. Get Domain Privacy from GoDaddy for just $1/year. Valid for only new domain registrations. Save 30% on Domain Privacy from GoDaddy. Get a .ca domain from GoDaddy for just CAD 0.99 a year. Valid for only New Domain Registrations for 1 year. Currency Restriction CAD. Get a .in domain from Godaddy for just $2.99 per year. Valid for New Customers only. Get a .de domain from GoDaddy for just $0.99 per year. Valid for New Customers only. 33% OFF on Domain Renewals, Hosting Renewal, Website Builder, SSL Certificate and Email plans. Now get SSL Certificates from GoDaddy for only $56.25 for a year. Pricing valid for first year only. Now work from anywhere. Get a discount of 50% on Microsoft Office 365 from GoDadddy. Build a better website in less than an hour with GoDaddy\'s new Website Builder. Try it for a month for free. SmartLine™ - One phone, Two numbers. Get your free 1 month trial from GoDaddy. Product for US Phone numbers only. Now get SSL Certificates from GoDaddy for only Rs. 699 for a year. Annual Purchase required. Pricing valid for first year only. GoDaddy is not just one of the biggest names in Domain Registration business but very well placed in web hosting industry too. The company offers a complete slew of web products and services from domains, shared web hosting, managed wordpress hosting, VPS, dedicated servers, cloud servers, website builders and professional email to web security solutions. GoDaddy is one of few web hosting providers that offer both linux and windows shared hosting. The company focuses its priorities in low cost price plans. If you commit to annual or multi-year hosting package, the price is significantly reduced. Go daddy has multiple data centers in US, Europe and Asia and uses latest technology for its servers and network. When it comes to technical support, many online forums rate the support at pretty good, but not exceptional. GoDaddy is currently promoting Economy shared hosting package which it sells at just $1 per month. This is a huge discount of 88% off the regular monthly price of $7.99. This plan comes with a free domain name, 1 hosted website, choice of cPanel or Plesk control panel, unlimited bandwidth and 100 GB of storage. To avail this GoDaddy offer, click on the link below. Given below is a detailed instruction set on how to sign up for $1/month Godaddy hosting. Click on the “Claim our 88% OFF GoDaddy Hosting Discount” button above. You will be taken to godaddy official website and $1/mo pricing will be activated on Economy shared hosting plan. You will see that there are 2 other plans on offer – Deluxe and Ultimate. While Economy plan allows you to host only a single website, with Deluxe or Ultimate plans you can host unlimited websites on the same hosting account. Click on the “SELECT” button for the web hosting package that you wish to purchase. Next you will be taken to a page where you can enter the domain name that you want to register. GoDaddy gives you a free domain name with each shared hosting package. Just enter the domain name and click on “GO”. If you go not wish to register a new domain name with godaddy, just click on “I Don’t want my FREE domain”. Next you will be taken to plan confirmation page. You will see a message on the top that promotion has been applied to your cart. You can select the hosting plan term here. The options are – 1 month, 3 months, 6 months, 12 months, 24 months, 36 months, 60 months and 120 months. You will see that as you move to a longer term plan, the hosting price is significantly reduced. You may add “Search Engine Visibility” addon, if you like or add a domain to your order. Verify the Subtotal on the right side of the page and click on “Proceed to Checkout” button. Next you need to login to your GoDaddy account, if you have one. If you do not have an account with GoDaddy, click on the create account button and proceed. Next select your preferred method of payment – Credit/Debit/Prepaid Card, PayPal, UnionPay, Gift Card, Checking Account and click on “Place Your Order”. What billing cycles does GoDaddy offer? GoDaddy offers several different payment cycles for different hosting packages. For basic shared Economy hosting plan, you can choose between 3 months, 12 months, 24 months and 36 months terms. The WordPress and Business hosting plans also include minimum 1 month and up to 60 & 120 months terms. What payment methods can I use for purchasing GoDaddy hosting? Godaddy offers several payment methods based on billing country/region and currency. You can pay using Credit/Debit/Prepaid Card (MasterCard, Visa, American Express, Discover, JCB etc.) and PayPal. These are standard across the globe, though there are other local payment options specific to each region/country. Customers with a US bank account can make payments by Electronic Check (ACH) or Wire Transfers. Apart from Paypal, other digital wallets like AliPay, Skrill etc are used wherever available. When do GoDaddy Promotional Code Expire? GoDaddy promo codes expire all the time. We check daily & try our best to remove expired codes & update this page with working Godaddy coupon codes. Can I pay for GoDaddy products or services using Bitcoins? GoDaddy does not accept any payment using Bitcoin or other cryptocurrencies. Does GoDaddy charge any setup fees for hosting accounts? No, Go Daddy does not charge any set up fees for web hosting services. Does Go Daddy offer Windows hosting? GoDaddy is amongst the few web hosting companies that offer Windows shared hosting. The Windows hosting plans come with Plesk Control Panel and are similar to Linux hosting plans in terms of features and prices. Does GoDaddy provide free domain name with hosting packages? Yes, when you purchase Godaddy shared or wordpress hosting plan for an annual or higher term, you can get one free com, net, org, co, in, xyz, club, or co.in domain name. This free domain name is available only for the length of the initial purchase term, after which you will need to pay the renewal price at the then-current rate. Also you need to pay the ICANN fee of $0.18 per year for the free domain name. Does GoDaddy offer managed VPS and Dedicated servers? Yes, Godaddy offers both Linux and Windows VPS and Dedicated server plans. You can choose the level of control that you need, as there are 3 options available for management of these servers – Self-Managed (complete control with the client), Managed (Godaddy takes care of the backups and patching, updates etc.) and Fully-Managed (all system administration tasks are taken care by Godaddy expert team). Does Godaddy provide any money-back guarantee? Godaddy has a different money back guarantee window for different products and services. For shared and wordpress hosting, this depends on the term of hosting that you signed up for. For annual or higher plans, you can request a refund within the first 30 days of buying the hosting service. For monthly plans (1 month, 3 month, 6 month or 9 month), you will need to request cancellation within 48 hours of your purchase, otherwise you will not get a refund. Some services are not even eligible for a refund. The rules related to domain name cancellations are different. For standard domain cancellations, you can get a refund up to 5 days. Does GoDaddy have a website migration service? Yes, Godaddy team can migrate a website for you, but this service is not available for free. They provide a built-in tool with Managed WordPress hosting account that you can use to move your WordPress website from another webhost. But for other hosting types, you will need to buy their Content Migration service which costs around $99. How can I contact GoDaddy team in case of an issue? You can reach out to GoDaddy team via phone or live chat option. Godaddy offers phone support in several local languages specific to each country that they operate in. They removed the email based ticketing support some time back. The phone lines and live chat are available all round the clock. Though you get unlimited bandwidth and storage with this plan, the number of websites you can host is capped at 1. A free domain name and Free Microsoft Office 365 Business Email is also provided. So if you want to launch a single website and need just the essential features, you are good to go with godaddy economy plan. The company is running an amazing promotion on their economy linux hosting (with cPanel), so you can now get it at just $1 per month for the annual plan. You get all the features of economy hosting with no cap on the number of websites you can host. So this is essentially Godaddy unlimited hosting with capability to host unlimited websites. If your business is growing, you will probably need more flexibility, power and speed for your websites. Godaddy ultimate hosting plan is a good fit for such users with free SSL certificate and free premium DNS for a year. Note that after the first year, SSL certificate and premium DNS automatically renew at the then-current rates. Our goDaddy ultimate hosting coupon entitles you to a saving of more than 50% on annual and longer term plans. This hosting is designed for high-traffic, resource-intensive, ecommerce websites. You not only get all features of ultimate hosting plan, but power of VPS and dedicated resources with easy to use cpanel interface. Godaddy offers linux-based managed wordpress hosting with four different plan options to choose from. Like other managed wordpress hosting solutions, you get hosting environment with pre-installed wordpress. They also take care of the core updates, plugin installs and updates and manage security of the website. You also get access to thousands of free godaddy wordpress themes. 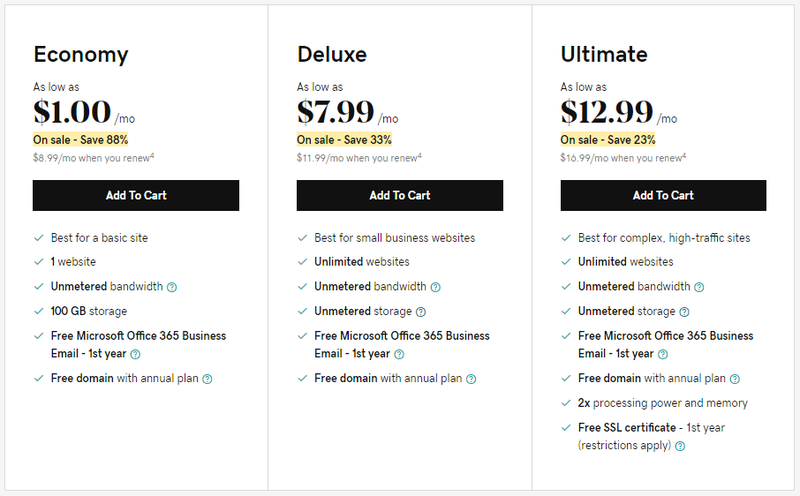 When you buy any 12, 24 or 36 months Godaddy managed wordpress hosting plan, you also get a free domain name and Microsoft Office 365 email free for 1 year. They take daily backups of your entire website which are stored safely for 1 month period and can be restored anytime using 1-click restore option. Godaddy drag and drop website builder comes in handy to create sites better and faster. The Godaddy Basic managed wordpress plan comes with 1 website install, 10GB storage and up to 25K monthly visitors. The next level Deluxe plan increases the storage to 15GB and visitors count to 100K approximately. You also get a staging site for testing. The ultimate managed wordpress hosting plan includes support for 2 hosted websites with 30GB storage and 400K monthly visitors. Also an SSL certificate is added for free for 1 year and access to malware scan and repair tool Website Security Essential for the life of the hosting plan. The highest level Developer plan builds on the ultimate plan by extending the sites that can be hosted to 5 with 50GB storage and 800K monthly visitors. You can avail huge discounts on Godaddy wordpress hosting plans using the below promo code. GoDaddy started its operations as a domain registration company and over the years has become the World’s #1 Domain registrar. Purchasing a suitable domain name is the first step in taking your business online. GoDaddy has an easy Domain Name Search option on its website to find whether a domain name is available for you to pick. Godaddy bulk domain search is also a very useful feature that you can use if you are searching for multiple domains in one go. GoDaddy provides several domain coupons that you can use to register new domains or renew existing domains with them. The best Godaddy domain promo code offers a .COM domain in 99 cents (ICANN fee is extra). New domain extensions are also available at a flat 30% OFF with godaddy new domain promo code. Several country/region specific domains can also be obtained at cheap rates. If you already own a domain with Godaddy, you will need to pay full price at the time of renewal. There are some Godaddy renewal coupons that offer price reductions for renewal of existing domains at godaddy.com. But these are very restricted time limited renewal promo codes. You can also avail godaddy offers on various domain services like Domain Privacy. Anyone who owns a website has probably heard of SSL certificates. It is extremely important for any business to secure their website and it holds true for individual bloggers as well. Modern browsers have mandated that all websites be made secure with use of SSL certificate; else they display security warnings to users who access your website. This has led to webmasters rushing to buy SSL certificates. Godaddy offers layers of managed SSL services. The godaddy SSL certificate price will depend on the type of certificate (which is dependent on nature of your website) and whether you want to protect single or multiple domains. There are three types of SSL certificates – DV SSL (validates domain ownership), OV SSL (validates organization and domain ownership) and EV SSL (extended validation that shows business is legitimate in addition to domain and organization validation). All these certificates include SHA-2 and 2048-bit encryption and are compatible with major browsers in the market. A standard Godaddy DV SSL is priced at $74.99 per year. But you can use Godaddy SSL coupon to avail up to 25% OFF on the price of any of these SSL certificates. Email is one of the most essential elements of your business. Using a standard free email service (like gmail or yahoo) for communication with customers and vendors is never a good idea. Email hosting solutions that allow email addresses matching your domain name are more efficient and lend professional touch to your business communication. Godaddy Email hosting offers quality and features that professional users desire at an affordable price. You get an ad free experience and be sure that your data is not shared with anyone. You can access your email account on the web or on the go. Office 365 email from Godaddy works with Outlook, Apple mail and other programs so all your devices are in sync. Whether you want an individual email account or for your entire organization, Go daddy business email plans have it all covered for you. There are 3 different email packages available to choose from. Godaddy provides Microsoft Office 365 email solution with all these plans, so quality and uptime is guaranteed. 1) Godaddy Email Essentials Plan – This is the basic plan that includes 5 GB storage for one email account. You can get this godaddy office 365 email essentials plan at just $1.99 per user/mo with a coupon code. 2) Godaddy Email Plus Plan – This plan offers ten times more storage than the starter essentials plan i.e. 50 GB per email box. The pricing is reduced to $3.99 per user/mo with a godaddy promo code. 3) Godaddy Business Premium Plan – This plan offers latest Microsoft Office 365 along with 50GB email storage. Several powerful business apps from Microsoft like MS Invoicing, Connections, Listings etc. and 1TB online storage are also included. This plan is available using godaddy email 365 promo coupon at just $6.99 per user/mo. Microsoft 365 is a set of productivity tools to improve your business operations. It also includes a very efficient email capability that in itself makes it worth the price. Godaddy has partnered with MS Office 365 to deliver you their business apps at a decent price coupled with godaddy’s expert customer service. With Godaddy Office 365 package, you get access to all collaboration tools, business class email (with 50GB storage per account), 1 TB of cloud storage via OneDrive, 99.9% uptime guarantee, HD video conferencing capability with Skype for Business (Windows) and Lync (Mac). 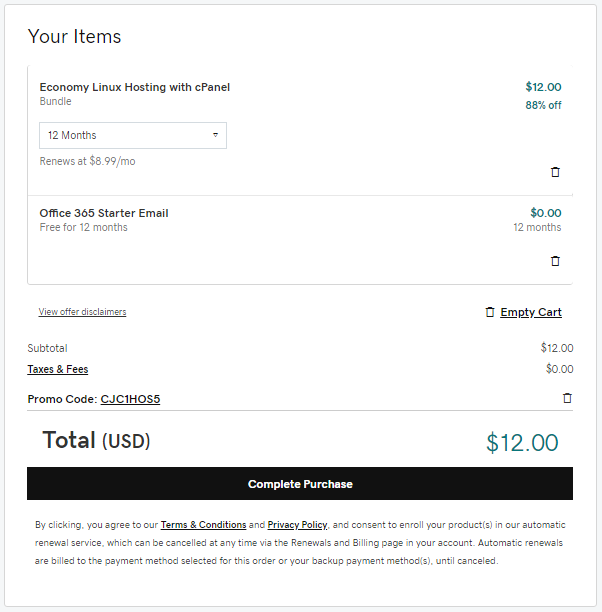 Godaddy is currently running a promotion, so their office 365 pricing has been reduced to $6.99 per user per month from $14.99 per user per month. GoDaddy GoCentral Website Builder is a replacement of godaddy’s old drag and drop website builder product. It helps to build and publish responsive websites optimized for mobile. It comes with simple site building tools that do not require any special coding skills or technical know-how. It is easy to get started and includes step-by-step tutorials that provide great help every step of the way. It comes bundled with hundreds of website themes and templates categorised by industry and niche. Personal Plan: Available at $5.99 per month, this plan provides responsive mobile design for creating great sites including blogging capability, image galleries, audio, video integration etc. Website hosting is also included with the plan. Business Plan: Priced at $9.99 per month, you get all features of personal plan plus inbuilt SSL security. You also get access to SEO wizard that improves your chances on Google ranks by helping you choose appropriate keywords, titles and tags on your web pages. Business Plus Plan: This plan costs $14.99 a month and builds on the Business plan with the additional capabilities of email marketing and social media integration. You can send up to 50K email a month to as many as 5K subscribers. Godaddy Online Store: For customers who want to sell online, this Godaddy ecommerce plan is available at $29.99 per month. You can easily build a full-featured ecommerce store, with built-in shopping carts for fast checkout, ability to accept payments through credit cards, debit cards, net banking and wallets. There are tools for order and inventory management, configuring shipping and tax rates. Also you can integrate functionality to offer discounts and coupons to customers. Godaddy Bookkeeping is a cloud based service that enables you to organize all your finances online at one place. It includes excellent tools for invoicing, taxation, sales tracking and can be easily integrated with Amazon, eBay, Etsy or PayPal seller account. This allows small time merchants to easily link and organize sales on these sites. Godaddy works with thousands of banks and credit unions, so linking your business account with Go daddy bookkeeping is never an issue. It can be easily accessed with any device be it desktop or mobile. There are three types of plans available. Godaddy Bookkeeping Price starts at $3.99 per month and goes up to $11.99 per month.